The finding of the True Cross, Agnolo Gaddi, Florence, 1380. The term True Cross denotes the actual cross on which Jesus was crucified. According to legend, the True Cross was hidden following Jesus’ death but was eventually found by Empresss Helena during her fourth century C.E. travels to the Holy Land. The cross was then broken up into different shards and distributed across Christendom to be used as relics. Throughout history, different kings and churches claimed to possess fragments of the True Cross to legitimize their power and status. For over a millennium, these supposed fragments of the True Cross were a prominent feature in the devotional practice of relics in Christian veneration. Saint John Chrysostom relates that fragments of the True Cross were kept in golden reliquaries that persons reverently wore upon themselves. By the end of the Middle Ages, so many churches claimed to possess a piece of the True Cross, that John Calvin is famously said to have remarked that there was enough wood in them to fill a ship. It is possible that many of the extant pieces of the True Cross are fakes, created by traveling merchants in the Middle Ages, during which period a thriving trade in manufactured relics existed. Today, Santo Toribio de Liébana in Spain is also said to hold the largest of these pieces and is one of the most visited Roman Catholic pilgrimage sites. Many ancient historians attest to the existence and supposed discovery of the "True Cross." Among these historians was Eusebius of Caesarea who, in his Life of Constantine, describes how the site of the Holy Sepulchre, originally a site of veneration for the Christian community in Jerusalem, had been covered with earth and a temple of Venus had been built on top—although Eusebius does not say as much, this would probably have been done as part of Hadrian's reconstruction of Jerusalem as Aelia Capitolina in 135, following the destruction during the Jewish Revolt of 70 C.E. and Bar Kokhba's revolt of 132–135 C.E. Following his conversion to Christianity, Emperor Constantine ordered that the site be uncovered and instructed Saint Macarius, Bishop of Jerusalem, to build a church on the site. In this Life, Eusebius does not mention the finding of the True Cross. A depiction of Empress Helena discovering three crosses in the Holy Land (including the alleged "True Cross"). 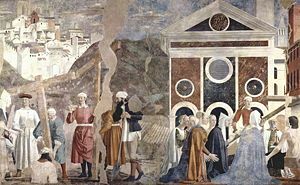 A fifteenth-century fresco from the Church of San Francesco, Arezzo by Piero della Francesca. Another ancient historian, Socrates Scholasticus (born c. 380), in his Ecclesiastical History, gives a full description of the discovery that was repeated later by Sozomen and by Theodoret. In it he describes how Saint Helena, Constantine's aged mother, had the temple destroyed and the Sepulchre uncovered, whereupon three crosses and the titulus (inscription) from Jesus's crucifixion were uncovered as well. In Socrates's version of the story, Macarius had the three crosses placed in turn on a deathly ill woman. This woman recovered at the touch of the third cross, which was taken as a sign that this was the cross of Christ, the new Christian symbol. Socrates also reports that, having also found the nails with which Christ had been fastened to the cross, Helena sent these to Constantinople, where they were incorporated into the emperor's helmet and the bridle of his horse. A third ancient historian, Sozomen (died c. 450), in his Ecclesiastical History, gives essentially the same version as Socrates. He also adds that it was said (by whom he does not say) that the location of the Sepulchre was "disclosed by a Hebrew who dwelt in the East, and who derived his information from some documents which had come to him by paternal inheritance" (although Sozomen himself disputes this account) and that a dead person was also revived by the touch of the Cross. Later popular versions of this story state that the Jew who assisted Helena was named Jude or Judas, but later converted to Christianity and took the name Kyriakos. 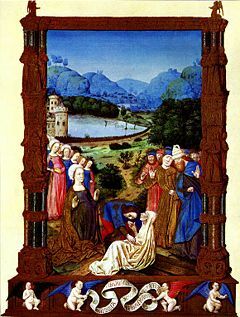 The proving of the True Cross, Jean Colombe in the Très Riches Heures. Along with the Cross were also found the Holy Nails, which Helena allegedly took with her back to Constantinople. According to Theodoret, "She had part of the cross of our Saviour conveyed to the palace. The rest was enclosed in a covering of silver, and committed to the care of the bishop of the city, whom she exhorted to preserve it carefully, in order that it might be transmitted uninjured to posterity." Historians consider these versions to be apocryphal in varying degrees. It is certain, however, that the Basilica of the Holy Sepulchre was completed by 335 and that alleged relics of the Cross were being venerated there by the 340s, as they are mentioned in the Catecheses of Cyril of Jerusalem (see below). In 614 C.E., the Sassanid Emperor Khosrau II ("Chosroes") removed the part of the cross as a trophy, when he captured Jerusalem. Thirteen years later, in 628, the Byzantine Emperor Heraclius defeated Khosrau and retook the relic, which he at first placed in Constantinople, and later took back to Jerusalem in March 21, 630. Around 1009, Christians in Jerusalem hid the part of the cross and it remained hidden until it was rediscovered during the First Crusade, on August 5, 1099, by Arnulf Malecorne, the first Latin Patriarch of Jerusalem, conveniently at a moment when a morale boost was needed. The relic that Arnulf discovered was a small fragment of wood embedded in a golden cross, and it became the most sacred relic of the Latin Kingdom of Jerusalem, with none of the controversy that had followed their discovery of the Holy Lance in Antioch. It was housed in the Church of the Holy Sepulchre under the protection of the Latin Patriarch, who marched with it ahead of the army before every battle. It was captured by Saladin during the Battle of Hattin in 1187 C.E. and subsequently disappeared. 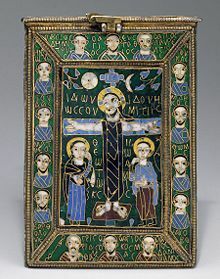 An enamelled silver reliquary of the True Cross from Constantinople, c.800. Other fragments of the Cross were further broken up, and the pieces were widely distributed; in 348, in one of his Catecheses, Cyril of Jerusalem, remarked that the "whole earth is full of the relics of the Cross of Christ," and in another, "The holy wood of the Cross bears witness, seen among us to this day, and from this place now almost filling the whole world, by means of those who in faith take portions from it." Egeria's account testifies how highly these relics of the crucifixion were prized. Saint John Chrysostom relates that fragments of the True Cross were kept in golden reliquaries, "which men reverently wear upon their persons." Even two Latin inscriptions around 350 C.E., from today's Algeria, testify to the keeping and admiration of small particles of the cross. Around the year 455, Juvenal Patriarch of Jerusalem sent to Pope Leo I a fragment of the "precious wood," according to the Letters of Pope Leo. A portion of the cross was taken to Rome in the seventh century by Pope Sergius I, who was of Byzantine origin. "In the small part is power of the whole cross," so an inscription in the Felix Basilica of Nola, built by bishop Paulinus at the beginning of fifth century. The cross particle was inserted in the altar. The Old English poem Dream of the Rood mentions the finding of the cross and the beginning of the tradition of the veneration of its relics. The Anglo-Saxon Chronicle also talks of King Alfred receiving a fragment of the cross from Pope Marinus, albeit the poem need not be referring to this specific relic or have this incident as the reason for its composition. Most of the very small relics of the True Cross in Europe came from Constantinople. The city was captured and sacked by the Fourth Crusade in 1204: "After the conquest of the city Constantinople inestimable wealth was found, incomparably precious jewels and also a part of the cross of the Lord, which Helena transfers from Jerusalem and was decorated with gold and precious jewels. There it attained highest admiration. It was carved up by the present bishops and was divided with other very precious relics among the knights; later, after their return to the homeland, it was donated to churches and monasteries." A knight, Robert de Clari wrote: "Within this chapel were found many precious relics; for therein were found two pieces of the True Cross, as thick as a man's leg and a fathom in length." "There is no abbey so poor as not to have a specimen. In some places there are large fragments, as at the Holy Chapel in Paris, at Poictiers, and at Rome, where a good-sized crucifix is said to have been made of it. In brief, if all the pieces that could be found were collected together, they would make a big ship-load. Yet the Gospel testifies that a single man was able to carry it." Conflicting with this is the finding of Rohault de Fleury, who, in his Mémoire sur les instruments de la Passion (1870) made a study of the relics in reference to the criticisms of Calvin and Erasmus. He drew up a catalogue of all known relics of the True Cross showing that, in spite of what various authors have claimed, the fragments of the Cross brought together again would not reach one-third that of a cross which has been supposed to have been three or four meters in height, with transverse branch of two meters wide, proportions not at all abnormal. He calculated: supposing the Cross to have been of pine-wood (based on his microscopic analysis of the fragments) and giving it a weight of about seventy-five kilograms, we find the original volume of the cross to be .178 cubic meters. A "Kreuzpartikel" or fragment of True Cross in the Schatzkammer of Vienna. The total known volume of known relics of the True Cross, according to his catalogue, amounts to approximately .004 cubic meters (more specifically 3,942,000 cubic millimeters), leaving a volume of .174 cubic meters lost, destroyed, or otherwise unaccounted for. A large quantity of wood also said to be from the True Cross exists at Mount Athos. In recent times, four cross particles—of ten particles with documentary proofs by Byzantine emperors—from European churches, i.e. Santa Croce in Rome, Notre Dame, Paris, Pisa Cathedral and Florence Cathedral, were microscopically examined. "The pieces came all together from olive." Gerasimos Smyrnakis notes that the largest surviving part, of 870,760 cubic milimeters, was in Mount Athos, 537,587 cubic milimetres in Rome, 516,090 in Brussels, 445,582 in Venice, 436,450 in Ghent and 237,731 in Paris. Santo Toribio de Liébana in Spain is also said to hold the largest of these pieces and is one of the most visited Roman Catholic pilgrimage sites. It is possible that many of the extant pieces of the True Cross are fakes, created by traveling merchants in the Middle Ages, during which period a thriving trade in manufactured relics existed. The Roman Catholic Church, many Protestant denominations (most notably those with Anglican origins), and the Eastern Orthodox churches celebrate the Feast of the Exaltation of the Cross on September 14, the anniversary of the dedication of the Church of the Holy Sepulchre. In later centuries, these celebrations also included commemoration of the rescue of the True Cross from the Persians in 628 C.E. In the Gallician usage, beginning about the seventh century, the Feast of the Cross was celebrated on May 3. According to the Catholic Encyclopedia, when the Gallician and Roman practices were combined, the September date, for which the Vatican adopted the official name "Triumph of the Cross" in 1963, was used to commemorate the rescue from the Persians and the May date was kept as the "Invention of the True Cross" to commemorate the finding. The September date is often referred to in the West as Holy Cross Day; the May date was dropped from the liturgical calendar by the Second Vatican Council in 1970. The Orthodox still commemorate both events on September 14, one of the twelve Great Feasts of the liturgical year, and the 'Procession of the Venerable Wood of the Cross' on 1 August, the day on which the relics of the True Cross would be carried through the streets of Constantinople to bless the city. In addition to celebrations on fixed days, there are certain days of the variable cycle when the Cross is celebrated. The Roman Catholic Church has a formal 'Adoration of the Cross' (the term is inaccurate, but sanctioned by long) during the services for Good Friday, while the Orthodox celebrate an additional Veneration of the Cross on the third Sunday of Great Lent. In Greek Orthodox churches, a replica of the cross is brought out in procession on Holy Thursday for the people to venerate. In the Latin-speaking traditions of Western Europe, the story of the pre-Christian origins of the True Cross was well established by the thirteenth century when, in 1260, it was recorded, by Jacopo de Voragine, Bishop of Genoa, in the Golden Legend. The Queen of Sheba worships the wood of which the Cross will be made. 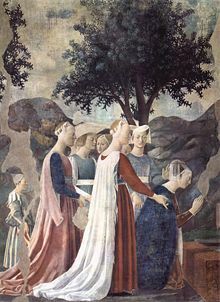 Fresco by Piero della Francesca in San Francesco, Arezzo. This states that the wood of the True Cross came from a seed of the Tree of Life which grew in the Garden of Eden. When Adam lay dying, he begged his son Seth to go to the Archangel Michael and beg for a seed from the Tree of Life. As he died, the seed was placed in Adam's mouth and was buried. The seed grew into a tree and emerged from his mouth. After many centuries the tree was cut and the wood used to build a bridge over which the Queen of Sheba passed, on her journey to meet King Solomon. So struck was she by the portent contained in the timber of the bridge that she fell on her knees and worshipped it. On her visit to Solomon she told him that a piece of wood from the bridge would bring about the replacement of God's Covenant with the Jewish people, by a new order. Solomon, fearing the eventual destruction of his people, had the timber buried. But after fourteen generations, the wood taken from the bridge became the Cross of the Crucifixion. Voragine then goes on to describe its finding by Helena, mother of the Emperor Constantine. 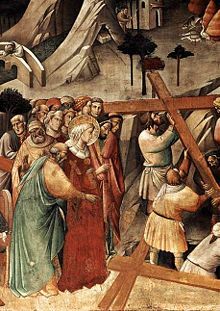 In the late Middle Ages and Early Renaissance, there was a wide general acceptance of the origin of the True Cross and its history preceding the Crucifixion, as recorded by Voragine. This general acceptance is confirmed by the numerous artworks that depict this subject, culminating in one of the most famous fresco cycles of the Renaissance, the Legend of the True Cross by Piero della Francesca, painted on the walls of the chancel of the Church of San Francesco in Arezzo between 1452 and 1466, in which he reproduces faithfully the traditional episodes of the story as recorded in The Golden Legend. It is worth noting that The Golden Legend and many of its sources had neither acceptance nor parallel in the Greek- or Syriac-speaking worlds. The above pre-Crucifixion history, therefore, is not to be found in Eastern Christianity. ↑ Life of Constantine, book 3, chapter 25 - 41 Retrieved June 10, 2008. ↑ 2.0 2.1 The Ecclesiastical History of Socrates Scholasticus Retrieved June 10, 2008. ↑ 3.0 3.1 Cyril of Jerusalem Retrieved June 10, 2008. ↑ Yvette Duval, Loca sanctorum Africae (Rome 1982), 331-337; 351-353. ↑ Wilhelm Ziehr, Das Kreuz (Stuttgart, 1997), 62. ↑ Medieval Sourcebook: The Anglo-Saxon Chronicle on Alfred the Great Retrieved June 10, 2008. ↑ Chronica regia Coloniensis (sub annorum 1238 - 1240), p. 203. Original book in Brüssel, three writers, two painters, last writing: year 1238; Georg Waitz, [Hrsg.] Monumenta Germaniae historica: [Scriptores]: Scriptores rerum Germanicarum in usum scholarum, 18, Hannover 1880, p. 203 (Pars Sexte, continuatio tertia monachi S. Pantaleon). ↑ See also: Ten sections of relics of the True Cross with documentary proofs, in Die Auffindung des Heiligen Kreuzes durch Helena - die Beweise Retrieved June 10, 2008. ↑ Robert of Clari's account of the Fourth Crusade, chapter 82: Of The Marvels of Constantinople Retrieved June 10, 2008. ↑ Calvin, Traité Des Reliques. ↑ William Ziehr, Das Kreuz (Stuttgart 1997), 63. ↑ Το Αγιον Ορος (The Holy Mountain), (Athens, 1903; reprinted 1998), 378-379. ↑ The term "Invention" is from the Latin invenire, to find (lit. to come across), and should not be understood in the modern sense of creating something new. ↑ The word "legend" did not imply "myth." The word, from the Latin, meant "script that is to be read." Thus the indisputably historic lives of early leaders of the Christian Church, such as Gregory, Saint Jerome and Saint Augustine of Hippo were referred to as their "legends". ↑ Jacopo de Voragine, The Golden Legend (late thirteenth century). Deuffic, Jean-Luc (ed.). Reliques et sainteté dans l'espace médiéval, Pecia, 2005. Retrieved June 10, 2008. Murray, Alan V. "Mighty against the enemies of Christ: the relic of the True Cross in the armies of the Kingdom of Jerusalem" in The Crusades and their sources: essays presented to B. Hamilton, ed. J. France and W. G. Zajac. Aldershot, 1998. pp. 217-238. Jan Willem Drijvers, "Helena Augusta" The three legends that circulated about the finding of the Cross, the Helena legend, the Protonike legend and the Judas Kyriakos legend, with references to the contemporary sources. Catholic Encyclopedia "The True Cross," a Catholic view. Fernand Cabrol, "The True Cross" a Catholic view. This page was last modified on 19 December 2015, at 18:04.